I just had to introduce you to the Eva Solo Smiley Bowl, just in case like me you are in a smiley mood after theBocca Sofa. This bowl will look great on your coffee table and you can use it for nuts or candy – great for Halloween or everyday if you have a sweet tooth like me! Now as you know I particularly like things that look good but that are functional too. The Eva Solo Smiley Bowl ticks both boxes. 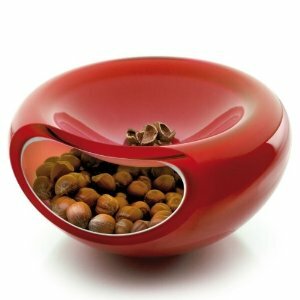 You can used the top of the bowl for empty nutshells or candy wrappers – perfect to put your guests at ease. Ever been offered candy in some else’s home and not know where to discard the wrapper?? What better welcome than a gorgeous smiling face filled with treats! The Smiley Bowl is available in red, black, white, clear, and lime. It is a little curvy number that will soften the clean, hard edges of many modern design schemes! This great conversation piece measures 5 inches tall and has a diameter of 8 inches and is made of multi-layer laminated glass and is available here. Previous articleBodum Assam 2-Cup Tea Press – Tea For Two! Next articleRabbit Wine Opener – So Easy Even I Can Use It!